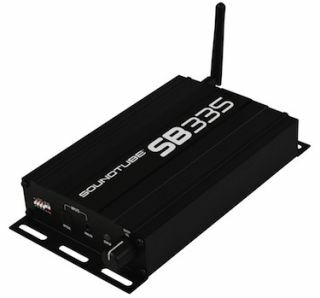 The What: SoundTube Entertainment's SB335 is a feature-packed mini amplifier for digital signage, museum, education and conferencing applications.The What Else: The newest member of SoundTube’s Small Amp series, this Class D amp provides three channels at 35 watts (8 ohms) or two channels at 50 watts (8 ohms). It includes both optical and analog inputs, enabling direct connection from most TVs or monitors, and also accepts inputs via Bluetooth enabled devices. The amplifier may be controlled via RS232 and also offers IR learning, allowing volume control from a TV remote. Other features include a line level subwoofer output and Dolby Digital decoding. The SB335 measures 8” x 4” x 1.125”. The Bottom Line: This amp is perfect for powering passive soundbars, such as the Teatro TSB3.0 from Soundtube's sister company Phase Technology, or it can be used to power up to three speakers. The SB335 is small, lightweight, and can be mounted in several different ways to meet installation requirements.